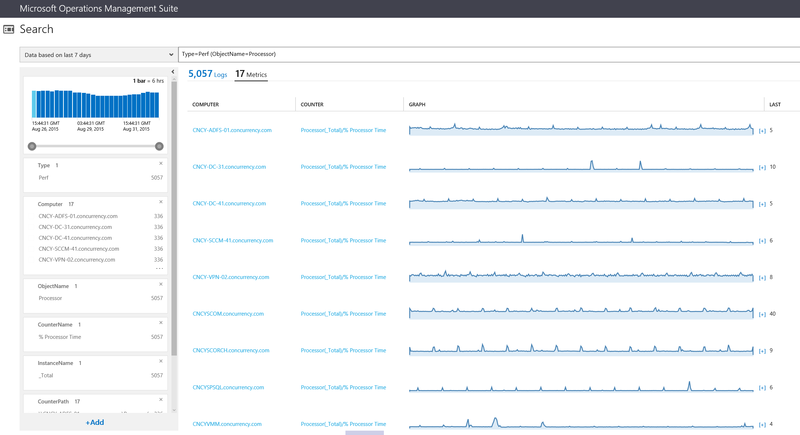 This week the Operations Management Suite team at Microsoft released a new feature for real-time performance analysis to understand both hourly and historical performance from servers within your managed cloud or on-premise infrastructure. The usage of the feature will drastically speed up understanding the performance challenges on target servers especially because System Center Operations Manager has historically been rather slow at providing that information for consumption. The Operations Management Suite has made visualizing performance data easy and fast. 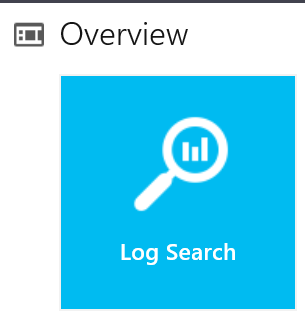 First, select “Logs” on the main page of your Operations Management Suite environment. This will bring you to the search UI for finding any data within OMS. To find *all* of your Perf Counters, type “Type=Perf”. You’ll see that I have 588 metrics in this system to choose from, which is too many to really use. I can either further edit my search query, or on the left hand side I can select various filters, which will do it for me. Select “Processor” from the filters, narrowing it down to just processor data. I can narrow it down to just one server and then look at its specifics. This is super helpful when trying to understand where specifically a server started having problems. Never have to open up perfmon on the server again! If I want to see it again in the future, I can save the search and even pin it on the main OMS page. This capability makes it easy to find your desired searches again. You can also access this datathrough the API and use it as part of an automation! 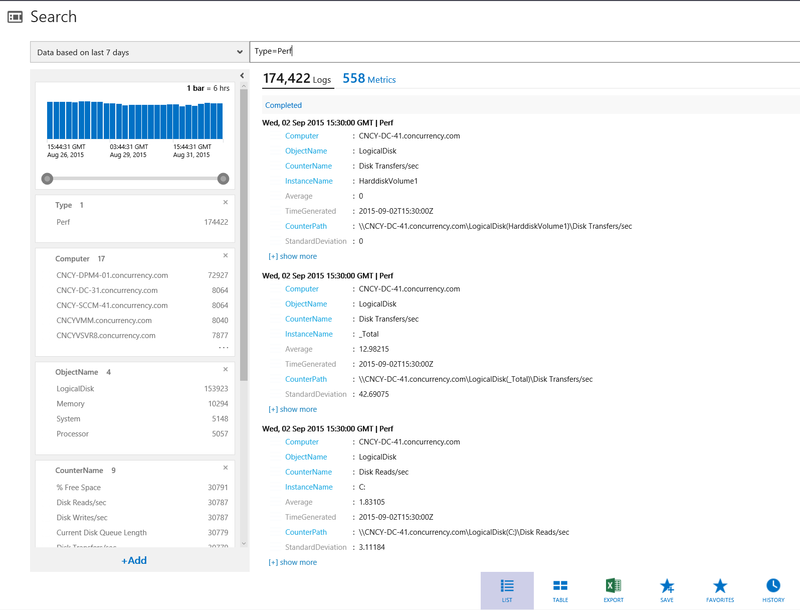 Dive into your Operations Management Suite environment and try it out! 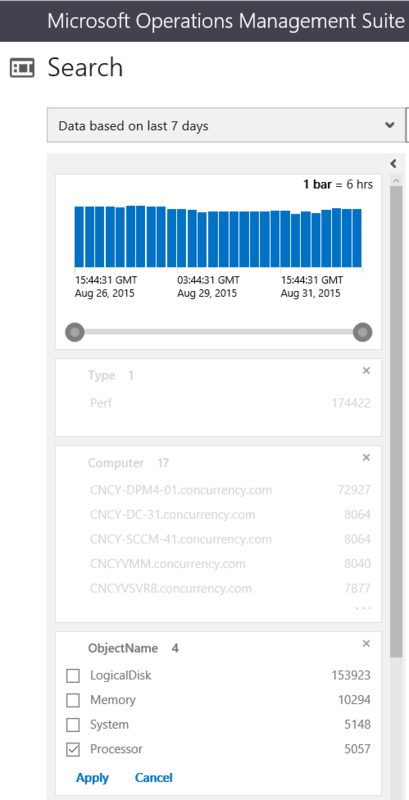 I’m sure it will help you to diagnose performance issues faster and get more value out of your SCOM investment.